With the temperatures setting new records every summer, the best option is to have an air-conditioner (AC). An AC that can work effectively in tropical climate of India where the temperature soars to 50oC. Daikin is an Japanese air conditioning company providing reliable and safe air-conditioning solutions to beat that extreme heat. In fact, Daikin was the first company in Japan to offer air conditioning systems. With primary focus on the air-conditioning and secondary business of fluorochemicals (refrigerants), Daikin operates in more than 150 countries. For quality control, Daikin ensures compliance with international quality check standards. The production process adopted by Daikin protects the environment by reducing the noise levels and lowering the power consumption. Daikin is one of the fastest growing AC brand in India with growth rate in double digits. Sighting the good acceptability and demand from Indian consumers, they have started a new AC manufacturing plant in Neemrana which became operational last year in 2017. For residential users, Daikin only offers split ACs. While for commercial and industrial users there is a wide gamut of options—cassette, ducted and VRV (variable refrigerant volume). In this article we would be focusing on the residential ACs from Daikin. Usually, the ACs come with “up and down” swing blade to disseminate cool air inside the room. But modern Daikin ACs from FTKP series comes with the 3D airflow function i.e not only vertical movement but also lateral movement (up-down + right-left) which blows the cool air in multiple directions to ensure thorough cooling inside the room. The main advantage of 3D air swing is the ability to spread the air flow across the room without the mandatory need of manual adjustment from the user. As a result, every corner of the room is nearly as cool as the area in front of the AC blade. Also, the louvres of the FTKP series ACs open upwards known as Coanda airflow. This means the cold air would not directly hit the people, something which we found really useful. Thus, Coanda airflow provides draftless, pleasant air-conditioning in the entire room. Whenever you hear a word AC, what comes to the mind is an appliance which blows chilled air bringing down the temperature of an enclosed space to comfortably cool levels. But the pioneers of air conditioning systems invented it with an idea of “conditioning” or setting it to a desired/specific temperature. So theoretically ACs should condition the temperature in the winter too as per the user’s need i.e it should heat the room during the frosty winters. Well, the modern premium split ACs are capable of implementing that theory (of heating during winters) too. Daikin Dual-Comfort series provides this 2-in-1 functionality. So be it hot summers or the cold winters, it would save you from the vagaries of tropical Indian climate, all year round. Even in the frosty temperature of 4oC, they can heat the room apart from performing the cooling operations in the other seasons. During the heating operation, the flaps direct the warm air to the floor by adjusting the blades to heat the room more quickly thereby resulting in energy savings. There are times when you spend an arduous day out in the parching sun and back home tired and sweaty. When back home, you yearn for a quickly cooled ambience. But then the old AC takes up a while to deliver comfort cooling, leaving you enervated. But with the new Daikin AC armed with Power Chill mode, this won’t be an issue. When enabled, it quickly maximizes the cooling effect irrespective of the operating mode to deliver faster cooling. By flattening the dual flaps and dispersing the air at a high speed, it promptly cools the room within 20 minutes. According to WHO (World Health Organization) levels of air pollution have tremendously increased in the developing economies with low and middle income including India. Lately, air pollution has been linked to an increased in respiratory diseases including lung cancer. The risk due to particulate type pollution is said to be similar to what is seen with second-hand smoke exposure. Particulate matter, PM 2.5 consist of very fine particles present in the air which are of the size two and a half microns in width (or even less). Micron is unit of measurement at a microscopic scale with one-inch equating to 25,000 microns. Emission from vehicles alongside the burning of wood and oil are the primary sources of PM 2.5 particulates. Step 1: Large particles of dust are collected by the first layer of pre filter. Step 2: Pollens and minute dust particles are charged by the plasma ionizer. Charged pollens and dust particles are absorbed by the electrostatic filter. Step 3: Titanium apatite photocatalytic filter made up of titanium oxide, adsorbs and decomposes the bacteria. Step 4: Finally, formaldehyde and other odor-causing minute particles are decomposed by the catalytic deodorant filter. This process makes sure all the bad smell is fully removed so that the disseminated air is fresh and odor-free. Though this 4-stage technology ensures circulation of fresh cool air inside the room, but it generates ozone as a byproduct. Though its not clear what amount of ozone is generated. Condenser used in the all the Daikin AC is made 100% of copper. . One of the important advantages of copper condenser over the conventional aluminum one is that heat transfer in copper is better. The copper condenser is more durable and much easier to clean and maintain compared to the aluminum condenser. The only downside of copper is that they are expensive than aluminum. Power cuts and load shedding is commonplace in India, especially in distant towns and villages. Being a heavy electrical appliance, AC is generally most susceptible to the erratic blackouts. Power cuts can damage the AC due to voltage fluctuations. Daikin’s modern ACs are well-equipped to handle this crisis. Premium FTKP series comes with the stabilizer-free operation. What this means is that AC can work steadily and reliably without getting damaged due to excessive flow of electricity in case of voltage fluctuations. Also, if voltage fluctuation exceeds the preset permissible limits (160V-264V), the power supply is automatically switched off, so it does not cause any serious harm to the AC. Thankfully, most of the Daikin ACs come with an inverter compressor. So, what is an inverter technology? Well, to be really simple, inverter technology is analogous to the car accelerator. When compressor needs more power, it gives it more power. When it needs less power, it gives less power. With this technology, the compressor is always on but draws less power or more power depending on the temperature of the incoming air and the level set in the thermostat. The speed and power of the compressor is adjusted appropriately. The compressor used in Daikin inverter ACs optimizes peak performance to give perfect cooling even in the extreme temperatures of up to 48oC. Talking about good thing first. Daikin AC offers Coanda airflow in which the blade swings upward, precluding cold air from directly hitting the users head sitting in the air-conditioned room. Another big advantage with Daikin AC is their air purification system. It is arguably the best in the business. 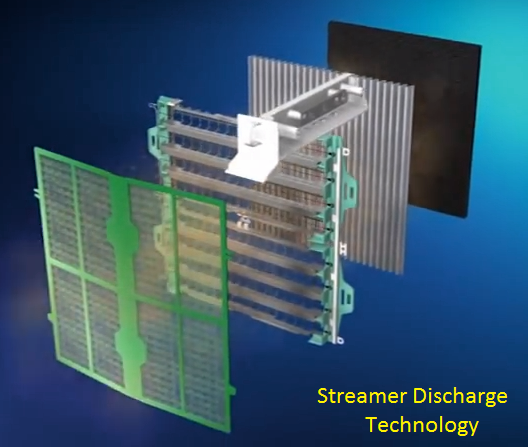 They employ a lot of technologies from streamer discharge to silver particle, from titanium filter to PM 2.5 filter to make sure the dispersed air is pure and odor-free. In fact, their air filtration system is acknowledged by National Asthma Council. R22 refrigerant a hydro chlorocarbon (HCFC) which results in ozone depletion is being completely avoided in the new models from Daikin. So, for all the present day new models, you will only find Daikin ACs either with R32 or R410 refrigerant. These refrigerants have zero ozone depletion potential. Finally, usage of the copper condenser in all new ACs is another big plus for Daikin as the condenser made of aluminum are pretty difficult to repair and have durability issues. Non-availability of windows AC is where Daikin seems to lose some prospective Indian customers as still there are families which would prefer windows AC over a split AC. Though most of the ACs from Daikin comes with an inverter technology, dual inverter technology used in LG is better and slightly more energy efficient. Also some models from Daikin have a lower operating temperature of 46oC which make them ineffective in peak summers in some cities with high temeperatures in India. So do make sure that you check the operating temperature before you buy a Daikin. Daikin is an established air conditioner brand which adopts the state-of-art technologies and components. Desistance from the usage of R22 refrigerant, aluminum condenser, and production of windows AC is the testimony of that. Daikin is a fast-growing AC brand in India with growth rate being around 20-22%. Efficient cooling with the ease of installation makes Daikin one of the respected brands even in the global air conditioning market. Premium Daikin ACs come with a smart human sensor which detects when someone is actually in the room and adjusts automatically to save on energy. Coanda 3D airflow delivers thorough cleaning without being concentrated only in the line of air swing. The 2-in-1 models take care of chilly winters by reversing the AC operation to make the room warm. Stabilizer-free operation and auto-restart shields the AC from vagaries of power cut and makes sure AC resumes with its operation smoothly after the power cut without hampering the pre-set settings. Inverter technology makes sure the ACs deliver the optimum cooling with precision being 0.5oC. So, if you are someone who wants a durable AC coming with a good purification system and only prefer copper condensers, then Daikin would be an ideal choice. Similarly, Daikin should be your preferred brand if your abode is close to water bodies like a lake, river, sea etc or near the industrial area where the discharge of harmful gases and fumes is recurring. Because Daikin’s Anti Corrosion series is specifically designed to protect the ACs from the harsh environment.